As Jews fast and mourn the Temple, Muslim Brotherhood members in Egypt will be protesting about their “holiest site” on Temple Mount. The Arab League has released a statement warning Israel to stay away from the Al-Aqsa Mosque. The mosque is located on the Temple Mount, which Judaism teaches is the holiest site in the world. Surprisingly, the Arab League statement termed the mosque “the holiest of the Arab and Islamic holy sites.” Normally, Mecca is considered the holiest site to Islam and Muslims in Jerusalem pray facing Mecca with their backs to the Temple Mount. The statement warned the “occupation authorities” against interfering with the mosque. “The city of Al-Quds [Jerusalem] and at its head the Al-Aqsa Mosque, is a red line that must not be crossed, and any attack on it will definitely endanger the safety and stability of the entire region,” it stated. The Arab League’s anger was aroused by what it termed an “extremist invasion” by police to check IDs and temporarily bar access to the mosque due to Ramadan. A Muslim Brotherhood-linked doctors’ association in Egypt plans to protest over the matter. 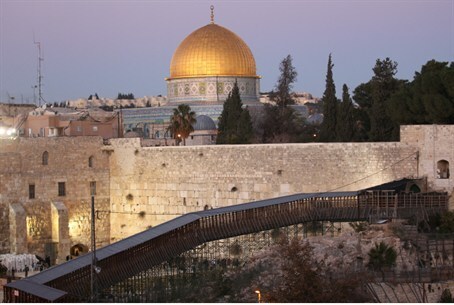 Its demonstration will be held on Saturday night, as Jews mourn the destruction of the Temple. The association may be burning the Israeli flag just as Israelis circle the Temple Mount in the annual Tisha B’Av (9th of Av) march.